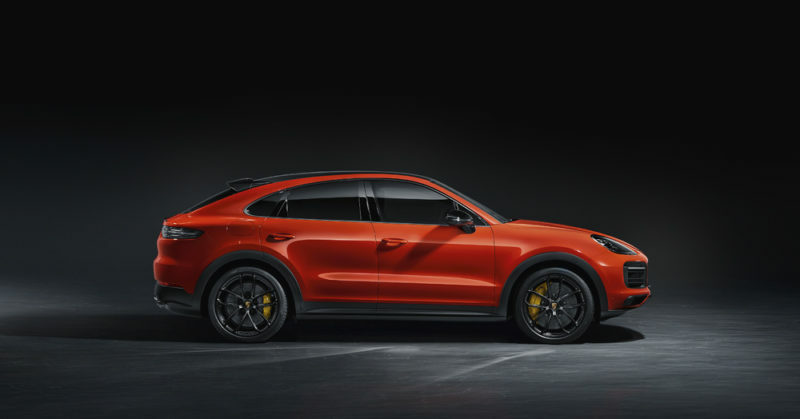 Porsche bills the new slanted roof Cayenne Coupe as "an even sportier vehicle" than its amazingly successful upright Cayenne has been. The Cayenne sold more units for Porsche Cars North America last month than any other, and this addition will surely keep Porsche dealerships rolling in SUVs for years to come. The new Coupe is 18 mm wider at the rear hips, and the whole roof is lower, with a more shallow windshield angle and lower roof line than the standard Cayenne. Some buyers might prefer the rakish looks of this shorter Cayenne, but it will have limited appeal with seating for four and a smaller rear storage area. The new four-door Coupe will launch with a 3-liter turbocharged V6 or a Cayenne Turbo Coupe can be had with the 4-liter twin-turbocharged V8. Porsche made some strange choices with this car, for example offering either a standard panoramic sunroof or an optional carbon fiber roof panel. The addition of an active speed-sensitive roof spoiler, extending 135mm at highway speeds to increase downforce to the rear axle. Allegedly that spoiler also works to increase the Cayenne's fuel efficiency. If you're familiar with the dynamics of the standard Cayenne, you'll likely be pretty in tune with this Coupe version, as much of the suspension and chassis work is carried over. Porsche has re-designed the rear seats, as they now sit a little over an inch lower than the standard Cayenne to make up for the lack of rear seat headroom. And, as mentioned, the Cayenne Coupe seats 4 instead of the traditional three-across rear bench seat. The question is, will this sell? BMW sells about four times as many X5 as it does X6 here in the U.S. Market. Then again, perhaps the Porsche SUV buyer is looking for something that at least looks sportier? It would stand to reason that Porsche has done its research on the viability of this car in the market, but it seems, from my position as an armchair quarterback, that this is a very small segment to be entering. In any case, the Cayenne Coupe is expected in U.S. showrooms for the 2020 model year in the fall of 2019. Starting MSRP for the Cayenne Coupe is $75,300 and $130,100 for the Cayenne Turbo Coupe, both excluding $1,250 for delivery, processing and handling. European buyers can place orders right now, and expect delivery in late May.